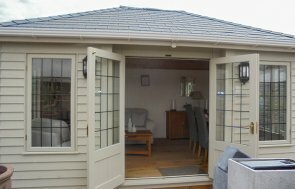 This Garden Room has been installed in our customer’s garden in Grantchester, Cambridgeshire. Our end to end service also included delivery and installation by our expert team. 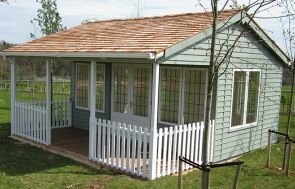 This particular Garden Room is 4.2 x 4.2m. The traditional-style hipped roof is lined with grey slate composite tiles and white guttering. This guttering provides an eye-catching border for the roof, as well as minimising water damage to the timber. The exterior cladding is painted in Sage from our Valtti Paint Range, a subtle nature-inspired green hue. Valtti paint is extremely durable as it forms a bond with the timber, ensuring the longevity of the buildings. Just wanted to say what an extremely lovely garden room you and your team have built for us. Thanks for being so helpful and responsive throughout with everything happening smoothly and on time. Ian and the guys were so nice and worked so hard. 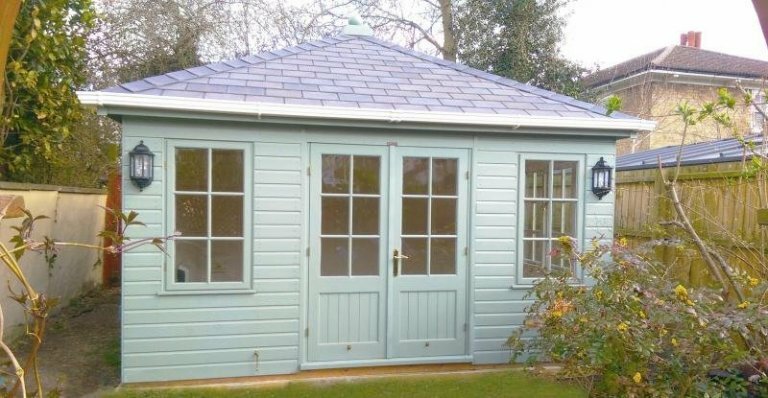 Our customer wanted to use their Garden Room as a year-round retreat. Therefore they chose to have painted matchboard lining on the walls, full insulation, an electrical pack with a heater, a lacquered floor and double-glazed Georgian windows. If you are interested in a luxury Garden Building designed just for you, you can see our full range at one of our seven UK Show Centres. You can also talk to a member of our team, who are on-hand to advise you on all of our designs, models and additional features.